For the occasional email that you may have to tap out on your tablet or smartphone, it doesn’t make sense to tote a whole physical keyboard in your bag. But then again, you can’t stand the virtual keyboard on your device because it covers up half your screen, making it difficult to see what you’re writing. So what options do you have? 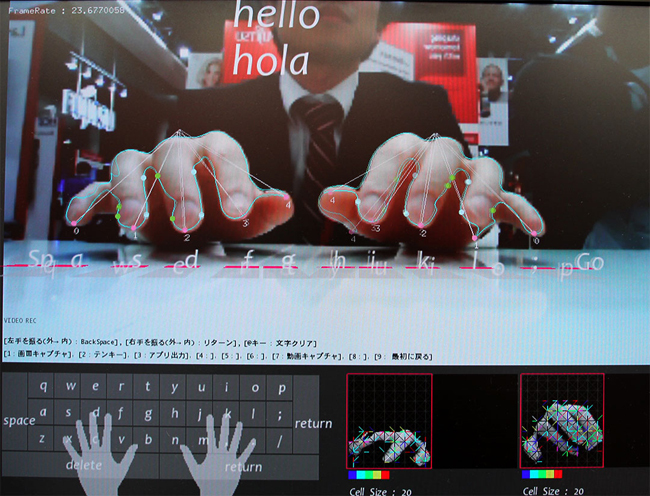 Fujitsu has been working on a way to use your tablet or smartphone’s front-facing camera to track your fingers so that you can type on any flat surface. TechCrunch spotted a demo of this prototype mobile typing technology at the company’s booth at Mobile World Congress in Spain earlier this week. 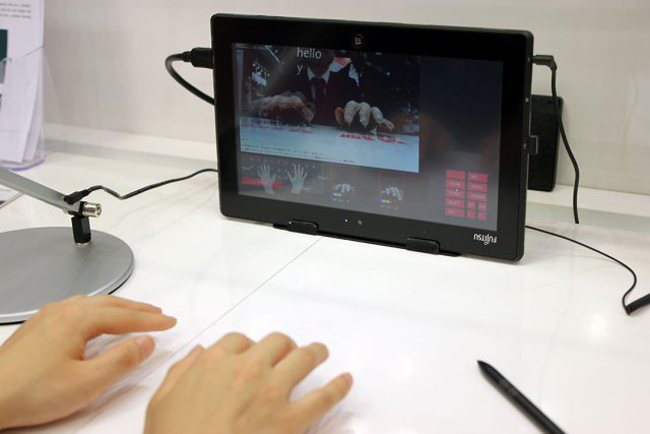 From what TechCrunch saw, the invisible keyboard is mostly driven by software that runs on a “generic Fujitsu Windows 8 tablet.” There is no fancy setup to make this technology work: the tablet just needs to be propped up in front of your hands, and your hands need to be brightly lit with a lamp so the slate’s camera can pick up on your fingers. It’s able to interpret what you want to type based on where your fingers are in relation to the keyboard layout and track their movements. While the software is smart enough to figure out what you’re tapping, it can’t really detect the movements of hands with darker skin tones yet. That’s why the prototype at MWC 2013 was setup for lighter skin tones, which meant the tablet ignored the taps of users with darker skin colors even though the software could detect their typing. In Ubergizmo‘s opinion, darker skin tones can be more difficult for the camera to track than lighter skin colors, so hopefully the Japanese company can overcome this technical huddle. Clearly, Fujitsu still has some work to do with the software before it is ready to be included into its smartphones and tablets – especially if those devices are expected to sell outside of Japan. But without the tactile feedback of a physical or even on-screen keyboard, will this gesture-based keyboard technology be any different from the lame laser projection keyboards you can get from the mall? What do you think?